Have a refined palate and enjoy pairing your wine with food? 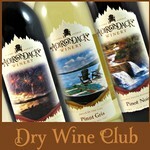 Then our Dry Wine Club is for you! Four times per year, you receive three bottles of Adirondack Winery's award-winning dry red and white wines in each club installment.